Last week I finally began scanning survey instruments to turn pencil and pen marks into data. Using the setup in the photo, I’ve scanned most of the surveys. The scanner I’m using is quite old but it’s a beast that still scans very quickly. 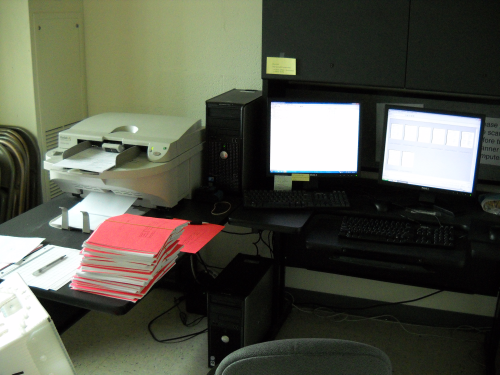 It even scans surveys printed on longer sheets of paper and on both sides; it’s what is used to scan paper versions of NSSE and BCSSE. And the fine folks in IU Center for Survey Research (CSR) are experts in this entire process so they know the hardware, software, and how it’s all used and they’re guiding me with patience and professionalism. Verifying the surveys – systematically double-checking responses the software thinks are missing and resolving ambiguous situations – takes much longer than scanning them. I can only spend two afternoons a week scanning or verifying but I hope to have this set of surveys done so I can send data back to participating institutions very soon. I’m still worried that there may not be much variance in the data. It sure seems like that as I glance at each survey while I’m batching, scanning, and verifying them. But that might be selection bias so I just have to wait until I have data in a usable format. It was also interesting to learn that one of the steps of the whole scanning-surveys-to-import-data process doesn’t work like I thought it did. In fact, the step – “monitoring” – doesn’t take place at all. I thought that there was a step after verifying where some survey instruments (1 out of every 10) were compared to the extracted data. Apparently CSR no longer monitors scans as the scanning process is so accurate that as long as the verification process is carried out accurately the data are accurate. In fact, monitoring not only makes the entire process longer but it may even introduce more error than it reduces. I thought that monitoring was an important part of the process but I trust the experts in CSR and their guidance. Finally, I really need to get back to working on my dissertation proposal. I’m having trouble getting myself into a productive routine. I hoped that my time would be more open now that I’m done with coursework but it seems like I have even more demands on my time. I’m pulling back from some things (I recently resigned from the ResNet Applied Research Group and I stepped down from my regional NASPA leadership position, for example) but I still feel it necessary to continue some non-dissertation-related activities. I need to find a better balance. Or move to a planet with longer days and more hours to get things done.